Native Peoples - Paleo-Indians were the first to settle in the Grand Canyon region about 11,000 years ago. Gradually, this culture evolved into to the Archaic, which ended about 3,000 years ago. Archeologists found remnants of this culture when they discovered small animal figures made of willow twigs in the caves of the Redwall Limestone cliffs. Radiocarbon dating revealed that the figurines were approximately 4,000 years old. No other indication of human habitation in the canyon has been discovered until the time of the Anasazi , who flourished in the canyon from 500 to 1500 AD. During the end of this time, the Anasazi, shared the region with the Cohonino who wove baskets and hunted deer, sheep and rabbits. Later, as the civilization advanced, the Anasazi settled into pueblos, or "towns," and built irrigation structures to aid in farming. Living in peaceful coexistence, both tribes traded with each other until a prolonged drought during the thirteenth century forced them to leave. As the Anasazi moved east, they became the ancestors of today's Hopi. More than 2,000 Anasazi sites have been discovered within the park's boundaries. The Tusayan Ruin, 21 miles east of the Village on East Rim Drive, is one of the most impressive. The ruin and the adjacent Tusayan Museum offer a unique glimpse into the lives of Anasazi who inhabited the canyon 800 years ago. The pueblo at the site was occupied by about 30 people who hunted, gathered edible wild plants, and farmed the land. About 150 years after the Anasazi and Cohonino exodus, the Cerbat moved into the western end of the Grand Canyon. Their descendants are today's Hualapai and Havasupai, who occupy reservations in the western end of the canyon, south of the Colorado River. Coinciding with the arrival of the Cerbats the Southern Paiute Indians began making hunting and gathering trips to the canyon's North Rim. The last native culture to arrive at the Grand Canyon was the Navajo, who have inhabited the area for the past 400 years. The Navajo reservation borders the eastern side of the canyon. In 1540, the Spanish explorer Francisco Vasquez de Coronado led the first expedition of Europeans into the American Southwest in search of the fabled Seven Cities of Cibola. While investigating other areas, Coronado dispatched Garcia Lopez de Cardenas and several men to the Indian lands along the South Rim of the canyon, where they were assisted by Hopi guides. It was Cardenas who made the first European discovery of the canyon, However, Cardenas and his men left disappointed that they had not found the riches they sought. In the 250 years following the Cardenas expedition, only a handful of trappers and missionaries visited the canyon. Most quickly turned away after finding the terrain impenetrable. It was first called the "Grand Canyon" by John Wesley Powell who, in a daring expedition down the Colorado River, led the first fully documented exploration of the canyon in 1869 with nine men and four boats. Powell's party covered more than 1,000 miles of the river in just 98 days. After he led a second journey in 1871, Powell published an official, illustrated report of his journeys in 1875, which encouraged many travelers to explore the Grand Canyon for themselves. Prospectors also entered the region hoping to cash in on the river's rich mineral ores. The canyon's ruggedness made mining extremely difficult, however, and pioneering prospectors soon realized that tourism would provide a more lucrative trade. One prospector, John Hance, built a ranch east of Grandview Point and began to offer bed and board to visitors. Reportedly the first white settler at the canyon, Hance arrived about 1883 and remained until his death in 1919. He is credited with carving many of the existing trails in the park, many of which follow old Havasupai Indian paths. Grand Canyon tourism began to boom in 1901 with the completion of the Santa Fe Railroad. Development of Grand Canyon Village began shortly thereafter, primarily by the Fred Harvey Company, which opened El Tovar Hotel in 1905. Many of the early buildings of Grand Canyon Village survive today and are included on the National Register of Historic Landmarks. Mary Jane Colter, an architect for the Fred Harvey Company from 1902 to 1948, designed several landmark buildings throughout the park. Colter applied her knowledge of architecture and ethnology, and with a respect for the Native American cultures that thrived in the canyon, designed Desert View Watchtower, Hopi House, Hermit's Rest, the Lookout Studio, Phantom Ranch, among others. In 1908, under authority of the Act for the Preservation of American Antiquities, President Theodore Roosevelt declared the Grand Canyon a national monument. This status protected the region from private development until 1919, when President Woodrow Wilson signed the bill creating Grand Canyon National Park. In 1979, it was named a World Heritage Site, joining Victoria Falls in Zimbabwe, Great Barrier Reef off the coast of Australia, and other distinguished sites having exceptional natural and cultural features considered universally valuable for all humankind. Because the Grand Canyon ranges from 2,000 feet to 7,400 feet above sea level, it can support a wide variety of plant and animal life indigenous to desert and mountain environments. Almost 2,000 animals and plants have been cataloged in Grand Canyon National Park. Four species of trees have adapted well to the rims of the Grand Canyon: the Ponderosa Pine, the Pinyon Pine, Gambel oak and Utah Juniper. At elevations below 7,000 feet the Pinyon Pine and the Utah juniper are the dominant members of the South Rim "pygmy forest." The short-needled pinyon is prized for its edible seeds. The juniper with its shaggy bark is particularly well adapted to this and climate. Ponderosa Pines grow to great heights proliferating on the North Rim. Also common here is the Banana yucca, one of the most common and useful plants in the American southwest. Native Americans have traditionally used it in the manufacture of soap, as a source of fiber for rope and sandals, and for its edible fruits which resemble small bananas. Grand Canyon is home to many shrubs, including Cliffrose, Fernbush (both members of the Rose Family) and Mountain Mahogany. The Cliffrose's gnarled branches produce white flowers in late spring, while the Fernbush is a late bloomer, waiting until August to blossom. Mountain mahogany sprouts a white flower that twists like a corkscrew when it rains. The bright red claret cup is the more common of two species of hedgehog cactus at Grand Canyon. At lower elevations its showy red blooms appear in April. On the edge of the rim it blooms in May or June. Today, 67 different species of mammals are known to inhabit the canyon region, including Bighorn Sheep, Bobcat, Mule Deer, Albert Squirrel, Coyote and Mountain Lion. In developed areas along the rim rock squirrels have lost their natural fear of humans and are often seen begging for handouts. It is dangerous and illegal to feed them. The Colorado River in the canyon region is home to 16 species of fish. There are also many reptiles and amphibians, including 22 types of lizards and 24 types of snakes. Among the reptiles commonly seen along the rim are the Eastern Fence lizards. Look for a blue patch on either side of their throat. Of the two dozen snakes living in the canyon, thhe commonly encountered are harmless to humans, usually Gopher Snakes, which feed son rodents and insects. Poisonous snakes, such as the Grand Canyon rattlesnake, Crotalus virdis abyssus, are found in the area, but are rare. More than 290 species of birds have also been counted. Seven types of hawks and eagles have been seen in the park, but the one most visible is the Red-tailed hawk. Both the Mountain Chickadee and the Nuthatch are small, acrobatic birds common in the Grand Canyon's coniferous forests. The White-throated Swifts and Violet-Green Swallows dive through the air in pursuit of insects. The large black bird commonly seen perched along the rim or soaring in the canyon below is the Raven. The Grand Canyon is the world's most spectacular example of erosion and most remarkable assemblage of exposed of rocks in sequence and intact. The Grand Canyon officially measures 277 river miles from Lees Ferry to the Grand Wash Cliffs. Today the Colorado River through Grand Canyon is bracketed at either end by dams - Glen Canyon Dam (Lake Powell) on the upstream end and Hoover Dam (Lake Mead) at the lower end. As a result, the dynamics of the Colorado River have changed considerably. Prior to its impoundment the river carried a sediment load many times what it carries today. Compared to the rocks in which it is carved, Grand Canyon is geologically young, occurring only in the past 6 million years. The Grand Canyon is the result of erosion, primarily by water. While the Colorado River has played the primary role in creating the canyon's present depth, runoff from rain and snow, and the streams that flow into the Canyon from both rims also helped shape and size the Canyon. Almost a mile -- 5,000 vertical feet -- below the South Rim of the Grand Canyon the Colorado River, from its origins high in the Colorado Rockies, the river flows more than 1,400 miles toward the Gulf of California and passes through a series of remarkable canyons, of which Grand Canyon is only one. In addition to its size, the Grand Canyon shares many things with its neighbors -- Zion, Bryce, Canyonlands, Arches, and Mesa Verde -- which all lie within the geologic province called Colorado Plateau. This region is characterized by relatively flat-lying sedimentary rocks of great thickness that have been raised thousands of feet above sea level in a series of pancake-like plateaus. Due in part to climate the semi-arid climate which exists in this part of the U.S., erosion proceeds in a very dramatic fashion. Each of the rock layers within the Grand Canyon erodes in its own manner, giving the Canyon its characteristic stepped-pyramid appearance. Shales erode to slopes, sandstones and limestones form cliffs; the dark igneous rocks of the Inner Gorge and southern end -- more resistant to erosion than the softer sedimentary rocks above-- produce the steep-walled narrow gorge. Vertical fractures are common and are responsible for the tall pillars and erosional remnants that are prevalent along the rims. The flat-topped mesas and buttes are characteristic landforms of Southwest where flat-lying sedimentary rocks are present. Many of the stunning colors of the remarkable features of this landscape are due to the presence of small amounts of iron and other minerals which stain the surface of the canyon walls. 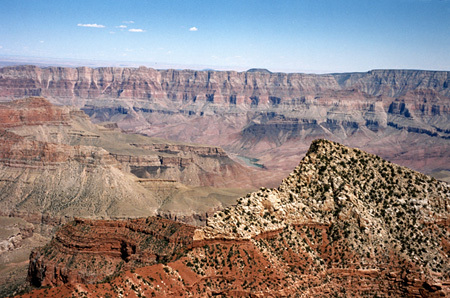 The measured thickness of rock in Grand Canyon is about six thousand feet. Each layer represents an interval of time during which a particular environment of deposition prevailed, but many of the layers are separated by gaps of unrecorded time and missing rock layers referred to as "unconformities." Most of the flat-lying rocks visible from the rims are Paleozoic in age, recording events that took place on the North American continent hundreds of millions of years ago, long before dinosaurs roamed the earth. The youngest of these layers is the Kaibab Limestone, the top layer, deposited in shallow warm seas at the end of the Paleozoic period (65 million years ago). Below the rim these layers become progressively older, reaching back into the early Paleozoic. Four thousand feet below the rim, in the walls of the Inner Gorge, are the oldest rocks of this region: the igneous and metamorphic rocks known as the Vishnu Group. Very different from the sedimentary rocks above them, these ancient schists and gneisses are almost 2 billion years old and form the very basement of the North American continent.